From its earliest appearance in recorded history, Arrow Rock has been a destination for travelers. Native Americans came for the flint at the "rock of arrows," Lewis and Clark noted "a cliff called the Arrow Rock," and pioneers stocked their wagons there before heading down the Santa Fe Trail. Established in 1829, Arrow Rock grew quickly and attracted powerful citizens, including the innovative Dr. John Sappington and artist George Caleb Bingham. 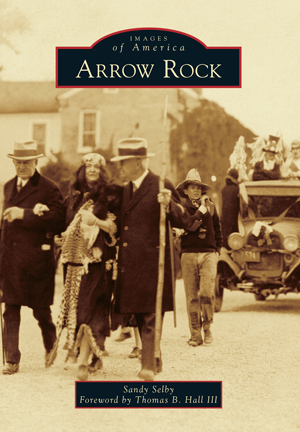 By the mid-1800s, Arrow Rock was a center for commerce and politics, but its prominence was short-lived. It was devastated by fires, bypassed by railroads, and abandoned by the shifting Missouri River. Its story might have ended there, but another kind of pioneer arrived in the early 20th century, when the Daughters of the American Revolution restored the deteriorating J. Huston Tavern. Other preservationists followed, and because of their commitment, today's Arrow Rock is a National Historic Landmark with lovingly restored properties, a thriving professional theater, and citizens who believe the town's future lies in its extraordinary past. Author Sandy Selby, an award-winning writer and editor, lives in Arrow Rock, where she serves as a town board representative, Friends of Arrow Rock trustee, and Historic Arrow Rock Council president.